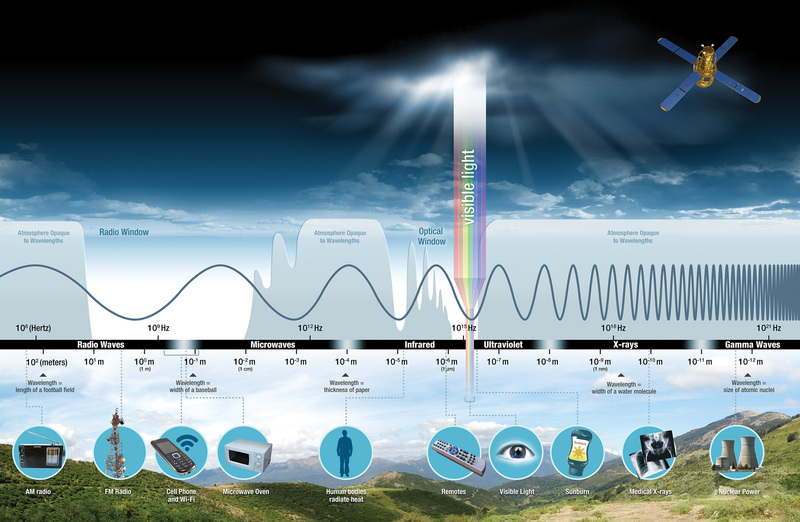 Radio waves have the longest wavelengths in the electromagnetic spectrum. They range from the length of a football to larger than our planet. Heinrich Hertz proved the existence of radio waves in the late 1880s. He used a spark gap attached to an induction coil and a separate spark gap on a receiving antenna. When waves created by the sparks of the coil transmitter were picked up by the receiving antenna, sparks would jump its gap as well. Hertz showed in his experiments that these signals possessed all the properties of electromagnetic waves. You can tune a radio to a specific wavelength—or frequency—and listen to your favorite music. The radio "receives" these electromagnetic radio waves and converts them to mechanical vibrations in the speaker to create the sound waves you can hear. Astronomical objects that have a changing magnetic field can produce radio waves. The radio astronomy instrument called WAVES on the WIND spacecraft recorded a day of bursts of radio waves from the Sun's corona and planets in our solar system. 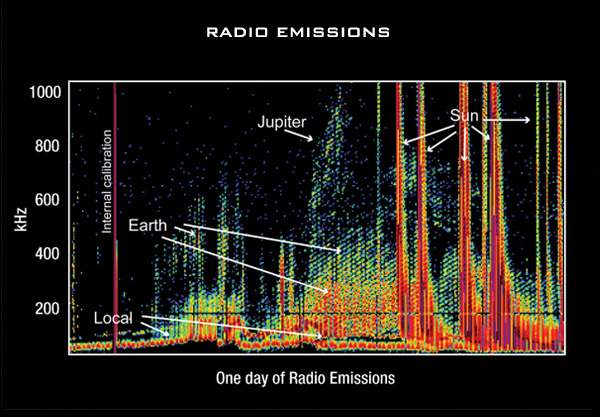 Data pictured below show emissions from a variety of sources including radio bursts from the Sun, the Earth, and even from Jupiter's ionosphere whose wavelengths measure about fifteen meters in length. The far right of this graph shows radio bursts from the Sun caused by electrons that have been ejected into space during solar flares moving at 20% of the speed of light. Radio telescopes look toward the heavens to view planets, comets, giant clouds of gas and dust, stars, and galaxies. By studying the radio waves originating from these sources, astronomers can learn about their composition, structure, and motion. 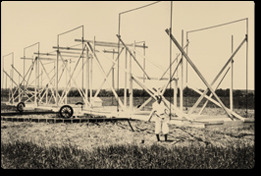 Radio astronomy has the advantage that sunlight, clouds, and rain do not affect observations. Since radio waves are longer than optical waves, radio telescopes are made differently than the telescopes used for visible light. Radio telescopes must be physically larger than an optical telescopes in order to make images of comparable resolution. But they can be made lighter with millions of small holes cut through the dish since the long radio waves are too big to "see" them. 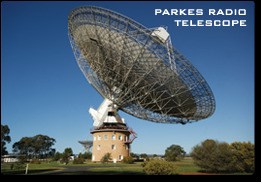 The Parkes radio telescope, which has a dish 64 meters wide, cannot yield an image any clearer than a small backyard optical telescope! In order to make a clearer, or higher resolution, radio image, radio astronomers often combine several smaller telescopes, or receiving dishes, into an array. Together, these dishes can act as one large telescope whose resolution is set by the maximum size of the area. The National Radio Astronomy Observatory's Very Large Array (VLA) radio telescope in New Mexico is one of the world's premier astronomical radio observatories. The VLA consists of 27 antennas arranged in a huge "Y" pattern up to 36 km across (roughly one-and-one-half times the size of Washington, DC). The techniques used in radio astronomy at long wavelengths can sometimes be applied at the shorter end of the radio spectrum—the microwave portion. 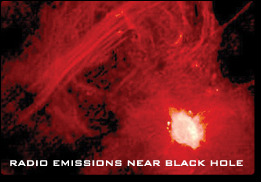 The VLA image below captured 21-centimeter energy emissions around a black hole in the lower right and magnetic field lines pulling gas around in the upper left. If we were to look at the sky with a radio telescope tuned to 408 MHz, the sky would appear radically different from what we see in visible light. Instead of seeing point-like stars, we would see distant pulsars, star-forming regions, and supernova remnants would dominate the night sky. Radio telescopes can also detect quasars. The term quasar is short for quasi-stellar radio source. The name comes from the fact that the first quasars identified emit mostly radio energy and look much like stars. Quasars are very energetic, with some emitting 1,000 times as much energy as the entire Milky Way. However, most quasars are blocked from view in visible light by dust in their surrounding galaxies. Astronomers identified the quasars with the help of radio data from the VLA radio telescope because many galaxies with quasars appear bright when viewed with radio telescopes. 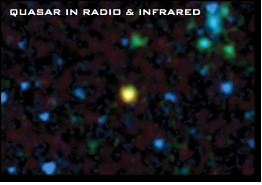 In the false-color image below, infrared data from the Spitzer space telescope is colored both blue and green, and radio data from the VLA telescope is shown in red. The quasar-bearing galaxy stands out in yellow because it emits both infrared and radio light.